Situated in Imerovigli, believed by many to be the finest area on the volcanic island of Santorini, the Santorini Princess Hotel is just a breath away from the spellbinding “Caldera”, offering a magnificent, unobstructed view of the legendary volcano, the blue Aegean and the famous sunset. The hotel features luxurious apartments for 2, 3 or 4 persons, spacious, impeccably designed and elegantly decorated in earth tones and warm hues. They uniquely combine contemporary style with traditional architecture, complete with arches and island features. Each guestroom is appointed with air-conditioning (heat/cold), a large private bath with Jacuzzi, hair dryer, mini bar, refrigerator, kitchenette, Satellite TV, digital safe deposit box, direct-dial phone, music, bathrobes, slippers and a veranda opening to spectacular vistas of the volcano, the blue sea, the surrounding mountains and the unparalleled sunset. The island of Santorini is a popular honeymoon spot and the Santorini Princess is the ideal place to spend an utterly romantic and unforgettable nuptial vacation. The Honeymoon Suite, fully tiled in marble, is expertly designed to emanate an atmosphere of sheer romanticism, complete with an outdoor Jacuzzi and a majestic view of the breathtaking “Caldera” sunsets. The exquisite a-la-carte restaurant is a luxurious dining area serving gourmet dishes from a carefully selected menu. Refreshing cocktails and cool beverages are served at the main bar, the pool bar or the lavish open-air lounge, overlooking the striking Caldera. The wide variety of the hotel’s well-designed facilities and services include 24-hour reception desk, Internet access, dry cleaning service, car and motorbike rental, transfer service (on request), outdoor pool, outdoor dining, indoor/outdoor café, TV room and private parking spaces. 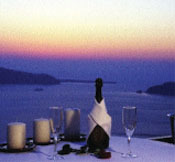 This is the only Spa overlooking the Caldera, a fact that contributes to its uniqueness, unbeatable ambience and quality. From the moment guests enter the hotel’s Spa, they are overcome by a relaxing and calming sensation, owed to the venue’s aura of total peace and revitalization, set in warm earthy tones and soothing decoration. Equipped with state-of-the-art facilities and staffed with experienced professionals, the Spa offers: sauna, Jacuzzi, foot massages, essential oils treatment, body waxing, facial care, body care, spa therapies and special wellness packages. The hotel organizes all types of functions, including unforgettable wedding galas in the plush restaurant and bar areas, while the outdoor facilities are ideal for open-air parties. Wedding certificates for newlyweds are issued, while expert staff takes care of the wedding car and reception area decoration.